Comments and questions about the APOD on the main view screen. From a non-astronomer -- something I've always wondered, and today's APOD prompts me to ask. If I lived on some hypothetical planet in a place like the middle of the Crab Nebula, would the night sky there be illuminated by the light that creates the nebula from our vantage point here on earth? I would imagine that If you were on a planet within the sphere of influence of the explosion that caused the Crab Nebula, you might be in a lot of trouble right now, If you survived. If you were in a system that was outside the bubble but close, the visible light would be (Slightly to moderately) different than the image. And the radiation levels would be very high. For a planet to support life in a nebula like that all that is needed is an incredibly strong magnetic field, then the constant aurora would be the dominant feature in the night sky. The more I learn, the more I know what I don't know. The docking bay on Luna is about a half a mile round. Under what you call a moon mound. Have a nice day all. Norval with a small hope of "one day". I did not know you lived at Tacoma, wow!!! I live just a skip and a jump away at skippy land. I use my tootoo flying rocket to get me around ever so quickly. The above is so important in relaxing the mind and allowing the gate keeper to open. Harry : Smile and live another day. 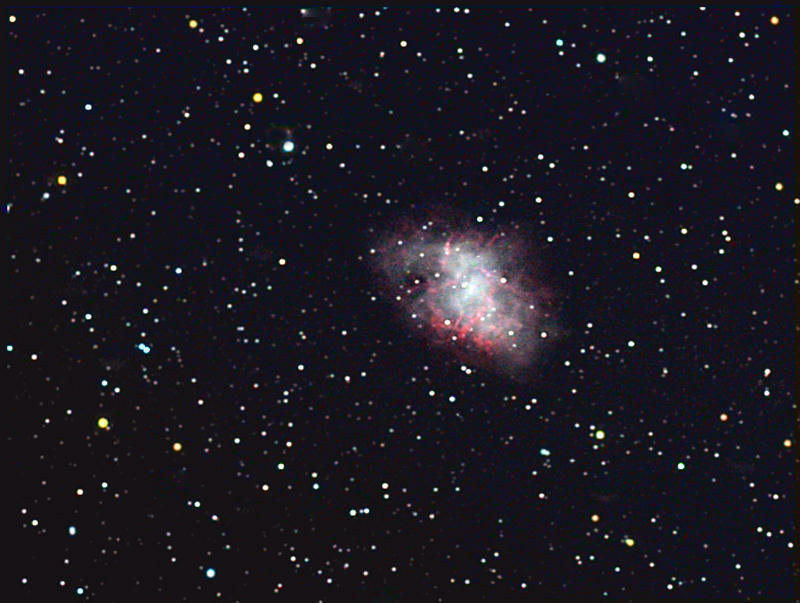 1) is the color in the following pic of the Crab Nebula taken by the HST given by the radiation in the visible region from the Nebula or just the "false-color" given by the HST? 2) if they are the "natural colour", how the nebula (electron, Sulfur and oxygen ions to be more 'exact') would emit or reflect radiations? I think this point has come up before...but isn't it interesting that "true" color is defined as "that small part of the EM spectrum to which human eyes are sensitive." Perhaps there is something “tactile” about knowing what objects would look like through our own eyes. Maybe the fact that we only perceive such a small part of the electromagnetic spectrum is a good thing. Could you imagine trying to process the universe in all wavelengths? Great image Empeda. Is it yours? I need to get me a good telescope. Any arguement on what is the best personal telescope available?? The light wouldn't be reflected, as the radiation knocks each electron off a photon of light is given off, depending on the element and the electrical charge different wavelengths of light are emitted. Same type of light as the aurora borealis or "Northern Lights" to us common folk,(also as a florescent light bulb). Ions and plasma. I thought this image may interest you.